The following are some brief comments from a few of the many happy couples (or their family and friends who booked us as happens) and who we have transported on their wedding day. We are happy for you to talk to any of them if you wish by arrangement (and with their consent of course) if you are thinking of booking with us and want to know what the couples thought of our service. Our wedding was on Saturday the 1st of July. The car we were supposed to use for our wedding pulled out very last minute, so my mum and husband booked through Devon County Wedding Cars as a surprise for me, as it was short notice I was a bit worried, but when the car turned up I could not have been more ecstatic. We had the Bentley R Type C20, it is absolutely stunning to look at, and incredibly comfortable to sit in (so I didn’t have to worry about my dress at all). The driver was very punctual, leaving no worries about timing, and he is obviously very passionate about the car. He’s an excellent driver, especially when handling horribly bendy Devon roads, and the car runs perfectly. I am very thankful that Devon County Wedding Cars were happy to help at such short notice, I couldn’t have wished for a better car, it was perfect for our special day, and I would most definitely recommend them to anyone looking for a great car and a wonderful experience. Many thanks, Charlie. Thank you for your amazing service and patience on Saturday. We had a brilliant time riding in your beautiful car. It was an experience my parents, husband and I will never forget. We will definitely recommend you to our friends. Thanks again! 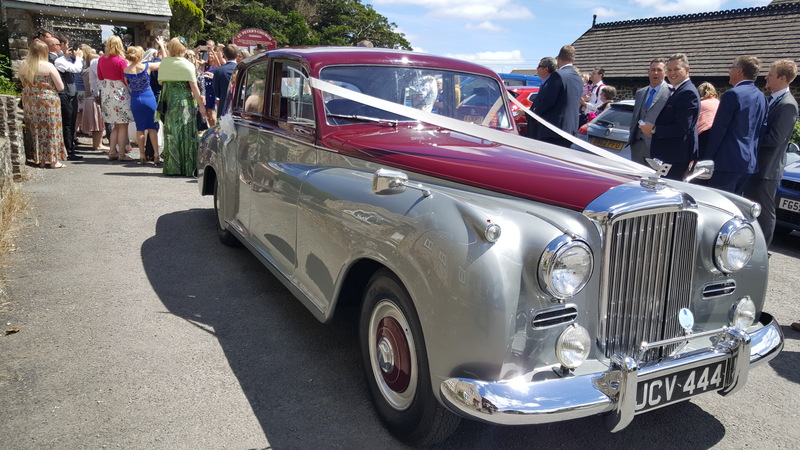 Our experience was excellent service from Devon County Wedding Cars in both the lead up to the wedding and on the big day. I would warmly recommend them to other people from their professional service, delivery and reasonable prices. A big thank you to Lorenz for looking after us on our wedding day. A good variety of cars to choose from and he was able to work well with our budget to meet what we needed. The car looked beautiful, he was very professional with good communication throughout, replying to emails quickly and answering any questions I had. Lorenz was very patient waiting for me to get ready and chatting to him on the way to the venue calmed my nerves! Thanks again Lorenz, you were a complete star. We booked this wedding car company at very short notice and they provided a wonderful service to us. The car was clean, and the driver was extremely kind, helpful and very smart. The photographs took rather longer then we expected and there was no extra charge. I would thoroughly recommend this company to anyone. Thank you. I was extremely happy with the service on my wedding day, the communication leading up to the day was superb and everything was organised perfectly! The service they provided ran smoothly from start to finish. I spent a lot of time looking for a car from my wedding. I really didn’t want the standard traditional wedding car and originally had my heart set on a Morris Minor. However, after looking around for close 3 months i couldn’t quite find what i was looking for until i stumbled onto the Mini MK1 convertible which was just perfect. The service we received from Devon County Cars (Lorenz) was great. He was lovely and very flexible. We had a Catholic wedding and we knew our service would be long and he was happy to wait for us and allowed us to take as many pictures as we wanted on the day. He turned up on time and the car was beautiful. I would even go as far as to say it stole the show.